KillerQueen is a sensational show paying homage to Britain's regal rock quartet QUEEN. Since the inception of KillerQueen back in 2003, and with their fully-costumed presentation, superb musicianship and incredible attention to fine detail. This fine detail not only includes their clever use of authentic instruments to reproduce the original sound, but also to the extent that the individual players onstage even resemble the actual members of Queen ... Yes, you would be forgiven for thinking that you are in the presence of the real band. International performances are very much part of KillerQueen's busy touring schedule. 2010 and onward has seen the band dividing its time between Australia and overseas performing in such places as Papua New Guinea, New Zealand, Singapore (3 consecutive years) and Norway (2 years in a row.) Also that year, KillerQueen frontman/founder John Blunt took to the stage to have some fun in a 'lookalike' competition for the French Television show Qui Sera Le Meilleur Sosie?, 7 million viewers tuned in globally. 2011 saw KillerQueen invited to headline Europe's famous 'Skaanevik Blues Festival' alongside legendary U.S. bands Journey and Foreigner. Later that year saw KillerQueen sharing the bill with Kelly Rowland, and wowing a 7,000 strong Brisbane crowd. 2012 had the guys returning to Europe once again to appear in front of 10,000 fans this time with none other than Thin Lizzy and Twisted Sister. KillerQueen's uncanny (and somewhat startling) resemblance to the original Queen has gained them much attention and recognition from their ever growing fan base, while their expert musicianship, ability to faithfully reproduce the 'difficult Queen sound' live, all the while consistently delivering a powerhouse show night after night has gained the band the respect of their industry peers. KillerQueen has also featured heavily in all facets of nationwide media, with extensive radio coverage as well as being no stranger to Australian television. 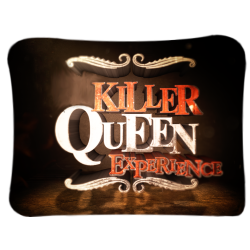 KillerQueen has received rave reviews and testimonials from all over the world including winning the praise of some of our music industry's biggest names. a very real Regal experience!